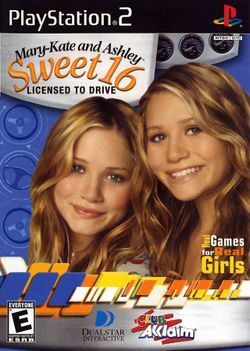 Mary-Kate and Ashley: Sweet 16 is a videogame published by Acclaim Entertainment. It is a party video game based off of real life celebrities Mary-Kate Olsen and Ashley Olsen. Up to 4 players compete on a board game track, playing minigames and picking up friends along the way. This page was last edited on 20 December 2014, at 19:54.